The MTD Gold Self Propelled Push Mower 12A-B29Q has a Honda 1600cc engine with an overhead cam and is emission certified. The engine uses regular unleaded gasoline , no mixing of gas and oil. To start the engine, all you need to do is set the choke and pull the chord. With a 21 inch cutting width, this self propelled lawn mower will make short work of your weekly lawn trimming. Something new on this model is the “beyond the wheels” cutting width, which is particularly useful when you need to cut close to a wall or around shrubbery. 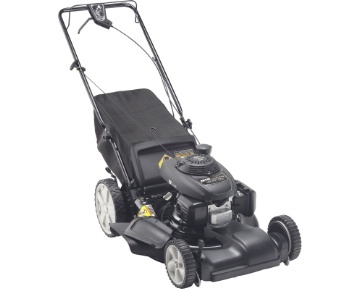 the large rear wheels provide additional leverage for turning and navigating around obstacles in your lawn. Consumers who prefer to mulch their grass can do so or they can easily convert to a grass catcher or even side discharge if needed without any tools. Most people will find that the mulcher works great on short grass, however if the grass gets too long between cuttings, you may want to use the rear bag or side discharge. The engine does not require priming to start it, just set the choke and pull the chord. Set the self propelled speed to match your walking speed for a comfortable rate. You can even adjust the handle to match your height for a comfortable position. The included wash kit is a great feature to help keep the inside of the deck clean and prolong the life of the deck. Assembly only takes minutes. Just unfold the handles, add oil from the bottle supplied and put fuel in the tank and you are ready to go. If you have used this self propelled lawn mower, and would like to add a comment, please do so at the end of this post. Always check the engine to make sure that there is sufficient oil in the engine before starting each day. Top up if necessary. Fill the fuel tank while the engine is cool. A good time to do this is before you start cutting the lawn. Fuel spills can sometimes cause fires. If you do spill any fuel, wait until it evaporates prior to starting the engine to avoid any chance of fire. Always fill the fuel tank outdoors. 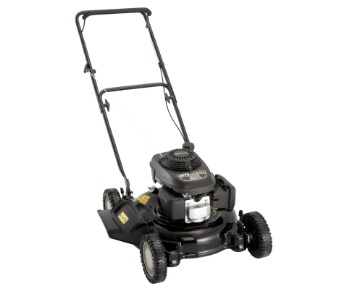 For more posts about front self powered lawn mowers, click here. The MTD Gold Self Propelled Push Mower V569Q cuts a 21 inch wide swath across your lawn making it a short job to cut the lawn and keep it looking great. The mulching deck means that you do not need to bag the grass clippings, however you can easily convert it from mulching to side discharge to a rear bag grass catcher in a matter of minutes with no tools required. Powered by a Honda 1600 CC engine, that is emission certified, you will have all of the power you need. 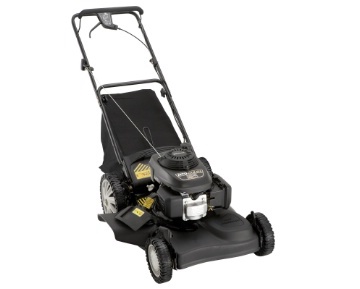 Starting easily and with large 12 inch high wheels this lawn mower is a great machine to use around shrubs and other lawn ornaments that you may have in your lawn. A really great feature of the MTD Gold Self Propelled Push Mower V569Q is the front wheel drive self propelled feature. We particularly like the front wheel drive since you can keep the drive engaged while tipping the lawn more up a bit to turn corners or to change direction. It is also variable speed which allows you to match the walking speed to a comfortable speed for your personal needs as well as local conditions. The wheels can be adjusted to one of 9 positions and the large 61 litre gas tank will keep you going for hours if needed. The MTD Gold Self Propelled Push Mower V569Q has lots of features that will appeal to many consumers. 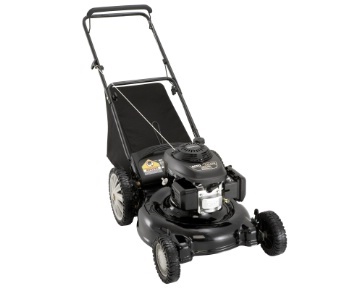 The squeeze and go front wheel drive variable speed lawn mower is a pleasure to use. All you need to do is steer and control the forward speed. Easily converted from rear bagging of grass clippings to mulching to side discharge, you can match your lawn cutting to the length of the grass or you particular requirements. The handle folds for easy storage and it assembles in minutes. All you need to do is unfold the handles, add the provided bottle of oil and add fule to the fuel tank. You are ready to go. If you have used this machine, feel free to leave us a comment. While cutting the lawn and using the side discharge, never allow anyone to stand beside the discharge. Or point the discharge at something that could be damaged by high speed flying objects ejected from the lawn mower. For more posts about MTD lawn mowers, click here.